CITB sponsored short courses – the more you learn, the more you earn! 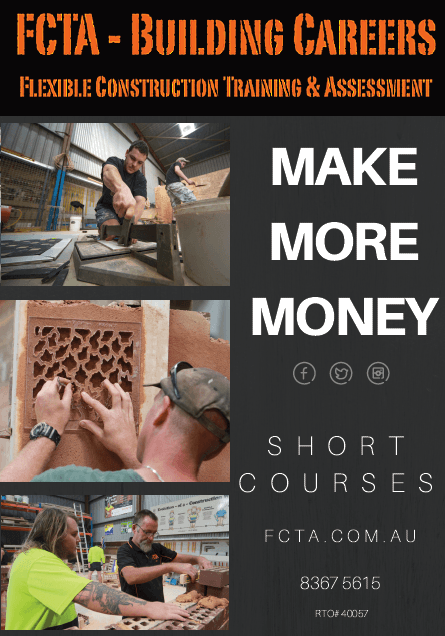 FCTA – Building Careers runs a series of short courses for existing tradespeople to increase their skills. Lots of the courses have cross over skills, bricklayers usually have the hand skills to pick up acrylic rendering quickly. Tilers who have only worked on domestic bathrooms and laundries can learn how to do high margin tessellated tiling. Anyone who is looking to gain their contractors license has the ability to attend the two mandatory small business units to apply for their license. For more information, download our brochure by clicking >> Course Guide, or call us on 8367 5615 or email admin@fcta.com.au.